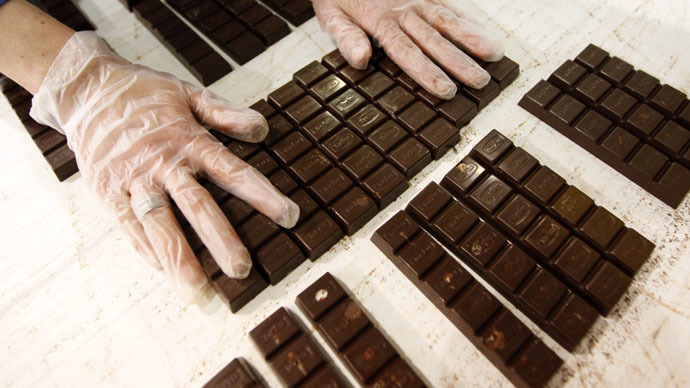 The first wrinkle-removing chocolate is set to hit stores and spa salons in the UK as soon as March. The ‘anti-aging chocolate’ is not only capable of improving skin conditions, but is low calorie and safe for diabetics. The tantalizing new product, called Esthechoc, has been developed by the Cambridge-based company Lycotec. The founder of the company, Dr Ivan Petyaev, is a former researcher at Cambridge University. The researchers say their anti-aging chocolate is based on 70 percent cocoa dark chocolate and contains a wealth of the antioxidants astaxanthin and cocoa polyphenol. The developers claim just a small bar of 7.5g of the Esthechoc, which is also called “Cambridge Beauty Chocolate,” contains as much as a 300 g fillet of Alaskan salmon. Dr Petyaev says the researchers used the same antioxidants that keep goldfish gold and flamingos pink. These substances improve the blood supply to the skin, thereby reducing wrinkles and making the skin look younger. According to the Lycotec scientists, the volunteers who ate the chocolate every day for four weeks of trials had visibly improved the condition of their skin. But while the benefits may come in a flash, working out the bite-sized fountain of youth was a far more laborious process. The creators of the anti-aging chocolate say it also improves blood circulation, and since it only contains 38kcal, it will be safe even for people suffering from diabetes. The researchers say they hope to attract customers at spas, salons and similar outlets. Nevertheless, critics of the anti-aging chocolate say the antioxidants work better if applied to skin directly rather than being taken orally. They have demanded more clinical trials to prove the effectiveness of the product.